The San Roque was carefully roasted for you by La Colombe. This fully washed coffee was grown in the Oparapa, Huila region of Colombia between 1,500 and 1,700 meters. This lot only represents the top 10% of the nearly 100 families who contribute coffee to the San Roque Association. The product of their hard work is evident in the cup with a smooth and balanced profile of chocolate, complemented by subtle notes of citrus, grape and cherry. This coffee isn't bad. It hasn't wowed me. I find it to be just a little bitter. I do enjoy the acidity of this coffee however. I do enjoy this coffee a bit more than the Kickapoo coffee. It is a little light and fruity for my palate. It's a good coffee if that is what you are looking for. it's pretty good. 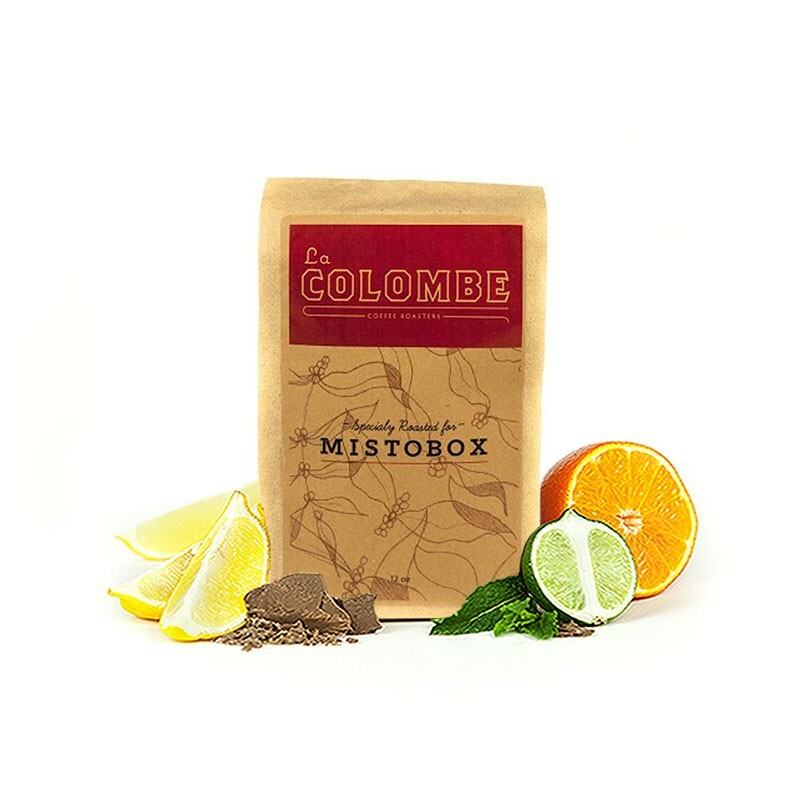 i think my first choice from mistobox was better, though. it's definitely well balanced and has some nice flavor. i like the lighter roast, but it just didn't have the complexity i usually love. is love to get some different flavors for the future. something African, maybe. Definitely a balanced cup. Seems to have some of the flavors of a darker roast than it is. I can appreciate the quality, but these flavors are not my favorite. I'm excited to start getting into some africans and maybe some naturally processed coffees, just generally more adventurous flavors. Really flavorful lighter roast that certainly highlights the chocolate, I feel like I could clearly taste a 70-80% cacao bar in there. As a pour over this coffee did excellent, taking on the full subtly of flavors. As an aeropress, I enjoyed a strong, delightfully pungent strength that was very unusual and I feel must have been the real terroir of this coffee. Quite nice. Nice fruit but the roast is a little too light and gets in the way of the silky body. Tried a few different ways, and V60 was the best balance for me. Chemex not bad, either. I enjoyed the coffee but there wasn't a taste that made me want to buy more of it. It's the type of coffee that is one you would drink if given to you but not purchase on your own. There just wasn't much flavor to it. This coffee is great - love the citrus! I think the citrus and cherry were very well balanced in aroma and flavor. Some citrus coffees can be overpowering or very acidic, but the right balance of chocolate, citrus, and cherry made just the right blend. The packaging was also fun! Really citrusy. Not my thing at all. Had to brew double to get a taste I liked. Edit: if I pull it as espresso, it's actually pretty wonderful. I'd like to have more of the notes from the first bag I'd tried though. Much more my style. This one is nicer brewed on the weaker side… I do love the tartness of it. Smells great out of the grinder. A decent coffee all around, I just prefer a slightly darker roast. As espresso, bittersweet chocolate dominates the palate with a nice acidity. Perfectly suited for espresso and milk. Haven't tried as a pour over, but probably a little darker than I'd like for that so I'll be sticking to espresso method. A little high on the acidity level for me. Still a solid cup. This batch is good, but not great. It has good mouth feel, and well pronounced chocolate notes, but any hints of grape and cherry are all but absent. Not a fan of Columbian coffee to begin with so I didn't have high hopes. Columbian coffee tastes too over-roasted and over-processed for me. This was great, and brewed well in the Mochamaster drip (60 grams for 10 cups) and Espro French Press (50 grams for 32 oz). Citrus and chocolate was very balanced. Ehh...it just didn't do much for us. It seemed lacking. Wow - a complex cup (to my taste buds) with more subtle flavor notes. Earthy, not tart. Very nice. Nice balanced cup of coffee. Really loved this one. The aroma was decent; it had bit of a bitterness to it. The flavor, however, had no bitterness and was very smooth and flavorful. The bag stated tasting notes of clementines, cherry cola and chocolate and that was right on the money. This coffee tasted great when brewed with any method I tried, pour over, french press and drip. Definitely in the top 3 I've received from mistobox so far. Absolutely phenomenal! I prefer dark roasts, but not too bitter. The citrus and the chocolate makes it very smooth, but at the same time provides everything you want from a dark roast. I have used this with my Chemex so far, and had great results (24 grams ground beans to 330 grams of water). Enjoy! I really enjoyed this coffee bean, it had a rich smooth chocolate flavor. I looked forward to drinking every morning. Wasn't feeling this roast at all. Too citrusy and a little too bitter for my taste.